There’s nothing like the rumble, roar, thump, clunk and bang of a backhoe working in the next ring over to test the mental state of a young horse just getting started under saddle. Thank goodness Conbrio is much quieter than her mother or her rider might well have been launched into orbit today! As it was, she was curious and alert, watchful and a tad distracted but not really worried. 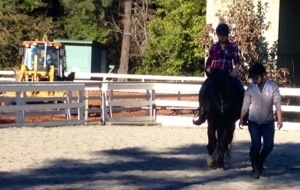 That laid back attitude is what makes her such a great pony and what will also make her excellent as a driving pony. Now, all we have to do is find a few extra hours in the day to get back to our carriage restoration project!